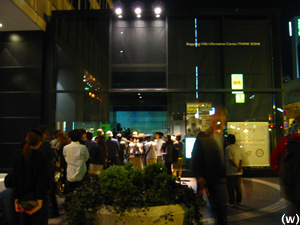 On October 12 to 13th, “Sonarsound Tokyo 2002” was held at “Roppongi Hills Information Center/Think Zone”. This event had two sides. 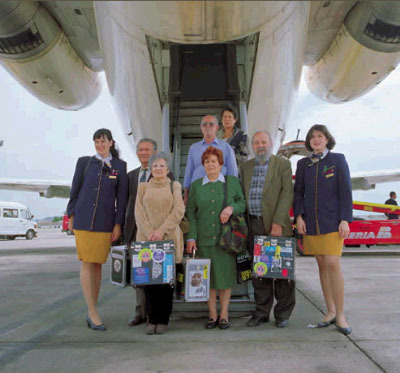 The first, as a satellite program of international advanced music/multimedia art festival “Sonar” held every year at Barcelona, Spain. 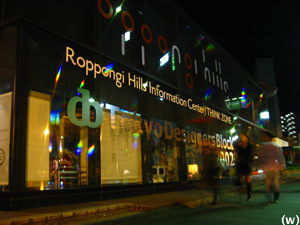 The second, as the related program of “Tokyo Designers Block 2002” held at the same time. It provided some insights about the present state of electronic music from the symposium/lecture by the critic/artist under activity in the front lines and the live performance by the worldwide musicians. 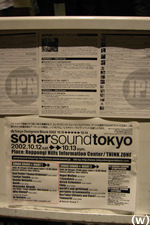 This report is mainly focusing on “Sonarsound Symposium” held on the 1st day and “sonarsound lecture” held on the 2nd day. 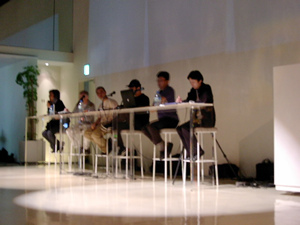 “Sonarsound Symposium” was held by participation of Fumihiro Nonomura, Joel Ryan, Atsushi Sasaki, Akihiro Kubota, and Yukiko Shikata under the theme “digital technology – music, image, art, and design – present condition, future, and vision of the further future” In this symposium, after introduction of the theme by Fumihiro Nonomura, each participant made the speech and debated to it. In the beginning is Akihiro Kubota. He is investigating the possibility of the computer as expression element material through work/performance of a work, teaching at a university. His speech consisted of the following subjects. “Just considering expression by the number on a computer whether it can be called the starting point of a digital design”, “Not digitization of existent things but expression of numbers is important”, “What does the relation between the interface and sense become?”, “Relation between expression and algorithm, and its distribution-use”, “What actually becomes possible by them?” &c. For me, his viewpoint of considering expression from the place that the number/digital exists first was felt interesting. Next, Yukiko Shikata who is known for as a critic or a media art-related curator, told about the relation between culture and digital through introduction of “kingdom of piracy“. It is the project with which she has been concerned, and was a project to the relation of the share culture and intellectual property rights by 13 sets of artists. 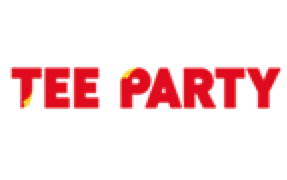 Originally it was planned to complete in May 2002, but under the influence of the pressure by the government etc., it became the project of the vagrancy, which a server continues moving. 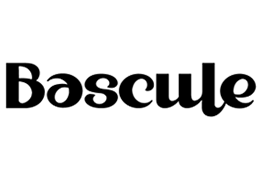 In this project, many interesting works like “RSG“‘s collection of Commodore 64 game’s cracking tag, or “exonemo“‘s MP3 cut-up using gnutella network are contained. In her speech some important problems such as “a boundary line of a crime and a mischief” and “what is the art in that case?” were shown. Especially, the indication of “having shifted to the network art work as open source and work space from the early work which had set weight to destruction of a code” was impressive for me. The third, speech of Joel Ryan was made through the interpreter of Hashim Bharoocha from “Headz.” Joel Ryan is a musician who pursues the improvisation live performance, which used the computer, and is also the researcher of “Steim“. He was speaking about subjects mixing many examples, such as “importance of the performance and the interface in electronic music”, “beginning to use PC for music in early 80s”, “relation between programming and the design”, “relation between improvisatorial performance and a computer”, “development of a new musical instrument”, and “costarring with Evan Parker”etc., I had a favorable impression in his performance oriented posture imagined from the word “too much studio works in a research organization” and “interested in real time”. 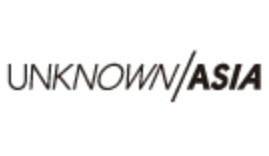 Atsushi Sasaki who is known for much writing, criticism and organized event by “Headz”. He showed DVD of “242 pilot” who are artists group centering on image, and he was going ahead with the talk focusing on their subjects, such as “the multinational group”or “performing image improvisatorially by use of nato“. Then, discussion was held about some subjects. About the relationship between performance and algorithm, the example where a violinist controls algorithm is shown from Joel Ryan. He also told about “brings physical properties to a relation with a computer”, and “the new musical instrument which can employ existing performing skill efficiently”. Next, to the recent criticism of “laptop performance is boring, because it has only sound”, Atsuhi Sasaki offered the opinion that “not to consider live performance = performer’s act but = environment”. Although this thinks is an interesting idea in that a viewpoint is shifted, considering that the live performance which care about the environment of sound system and sound of space more than performance seldom actually exist, a question remains a little. Furthermore, Joel Ryan offered the opinion “It is more interesting when it is not one-way but interactive. For example, it is more enjoyable to play a video game more than when only to look it” for the relation of performance and media art, and as a reply, Yukiko Shikata told “Now a days, what makes a place and space as an art work is appearing”. Although it was a little regrettable that there was not much audience, this was a substantial symposium by people under activity in the front line. It became a good opportunity for me when grasping the present condition of “technology/art/expression”, and someone’s word “various boundaries including an art and a non-art are swinging now”, and Joel’s word “As the surfer became a skater in the 60s, from the physical world to a digital world”wer impressive. 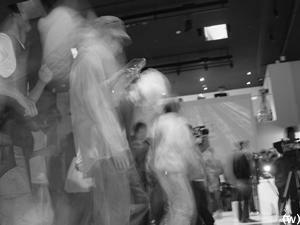 Then, the performance by WhySheep?, Numb, DJ Kentaro, Dennis DeSantis, Hiroshi Watanabe, Soul Center, Fumiya Tanaka etc. were performed in the night of the day. 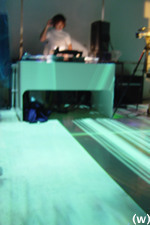 On account of the schedule, I was hardly able to participate, to a friend’s talk, the performance of DJ Kentaro attracted attention of much audience. Actually, many staff watched his play in a rehearsal, isn’t that the relation between an act and sound can be grasped an important thing at least for an audience side? 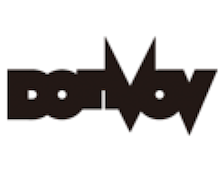 “Sonarsound Lecture” on the 2nd by navigation of Shusaku Hariya from “Salon” invited three persons, Yoshio Machida, Akihiro Kubota, and Joel Ryan, to the guest under the theme “AUDIO+VISUAL+MEDIA”. 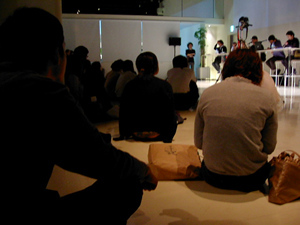 It was held in form that each performs short performance and a short lecture. 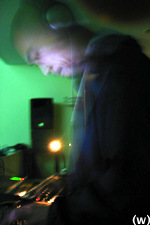 Yoshio Machida‘s performance by his own making instrument “Amorphone” and “MAX/MSP” patch was making comfortable atmosphere with fine phrases and overlapped processing sound. At a subsequent lecture, as explanation of the manufacture process of “Amorphone”, he told about “An oil drum was struck and tuned up with a hammer” or “It’s different from the general tuning and the usual steelpan.” He also spoke “Amorphone and patch can make sound from the start” or “live performance is making sound on the spot” as an explanation of his work. In his talk about the Amorphone’s tone, “It cannot be made unless it protects an ear by earpad because of the use of hammer, there is sound known by making from the body”could be heard interestingly. 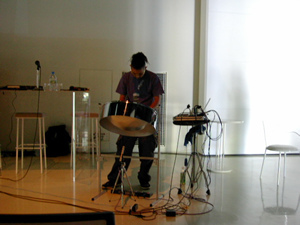 Next, continues on the previous day, Akihiro Kubota performed. 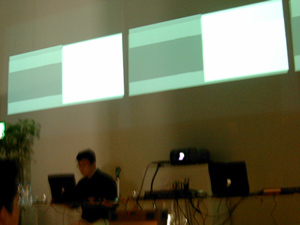 His performance combined the Square image with the coarse texture projected synchronizing with a division pulse sound. By the continuing lecture, the reference to expression on the real time by the computer, the relation between algorithm and improvisation, programming in expression, the interface that is easier to intervene were spoken. It can have sympathy in his remark “What may have the program which improves by practice?” His future writing/expression activities are pleasure. Joel Ryan, he also follows on the previous day. 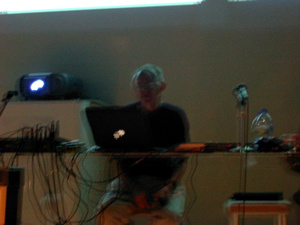 First, he talked about the lack of control of the user to the relation between the body and a computer, the nimbleness of the throughput of the body, and a program was told to the bottom of the keyword “touch” as an idea over his own musical instrument. Then, as introduction of Steim which is the research organization of electronic music with which he belongs, the presentation which mixed the movie about various musical instruments were performed. 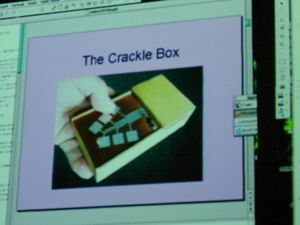 Such as Michel Waisvisz‘s “The Hands” which is the hand equipped synthesizer and “Cracklebox” which can make sound from touching the circuit, or “The Web” which can operate two or more parameters simultaneously. His talk “When making sound with a computer, it can be heard as change of various parameters such as frequency or volume, but in the case of a musical instrument especially singing, even if it was operating with various parameters, such as a form of a mouth, or quantity of breathing, it can be heard as change of one tone.” remained in the impression strongly. Finally he talked about “TGarden” as introduction of his engaging project. In this work spectator attached costume to their body, and the space is changed by the motion of them. It is the work as a place, which also became a topic on the previous day. With continuing his performance he made sounds with “SuperCollider” like it does not seem to be from one material with granular synthesis of a cello sample. It was regrettable that planned discussion has been lost on account of time, but interesting subject is unfolded similarly on the previous day. In the subsequent event, Joel Ryan performed again. Then, the performance by world’s end girlfriend, Yamauchi, portable[k]ommunity, Yoshinori Sunahara, Ulrich Schnauss, Fibla, Nao Tokui (Clickety And Clack), Angel Molina, etc. was performed, and Zone was filled with sound and the image. Although it had a difference in the number of the audience of daytime and night, its contents by which both sides were substantial, and, probably, became a good opportunity to know the part of the present electronic music for every participants. I want these contents to be exhibited by somewhere.